If you are like us, you may have one too many beers to keep in your standard refrigerator. Therefore, the desire to have a fridge to chill your beers becomes more of a need than just a want. 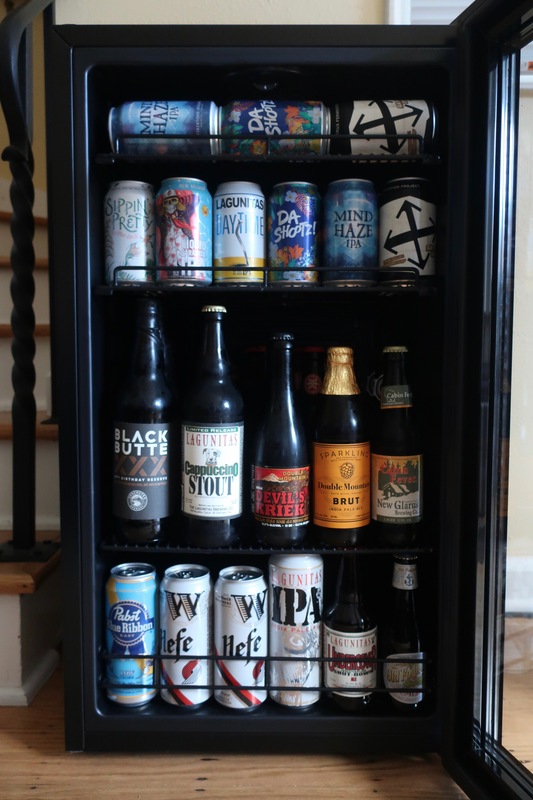 We were recently offered to try out the new NewAir Beers of the World Custom Beer Fridge. This fridge arrived to our doorstep and was very easy to move and install as it weighs 63 pounds. All we had to do was cut some tape at the bottom of the box and lift the top the box upward. After reading the owner’s manual for the Beers of the World Fridge AB-1200BC1 we plugged the power cord in and we arranged the fridge’s SplitShelf design. This exclusive shelf design allows the best way to properly cool down our various sized beers, both in bottles and cans. Plus, with one Split-Shelf that is half-depth, this allows for an even more exclusive footprint inside the fridge. If you have different size bottles to cool, you can place these half-depth shelves in the back to allow for greater flexibility. The NewAir Beers of the World Custom Beer Fridge holds all different sizes of beer cans and bottles. If you want to go with solely 12-ounce cans, this fridge will hold up to 126 cans, that’s 21 six packs! Since we have a wide array of container sizes, we installed the shelves to best fit our needs. The thermostat in the Beers of the World Fridge is very easy to customize all the way down to 32 degrees. There are seven different settings that will allow you to keep your beer the temperature you choose from its quiet compressor. Since there is no tiny freezer as in most mini-fridges, this allows for a much better thermostat to store beer in. No fear of freezing your beer if the beer’s placed too close to the freezer. Plus, with no freezer installed this means there is more cubic inch space inside for just beer! When it comes to the aesthetics of the Beers of the World Fridge this is also where this beer fridge excels. The clear double-pane glass door is a tough one that’s held in place by a durable stainless-steel door frame. Inside near the thermostat is the LED interior light switch. You can choose to have this energy saving LED light either on or off. 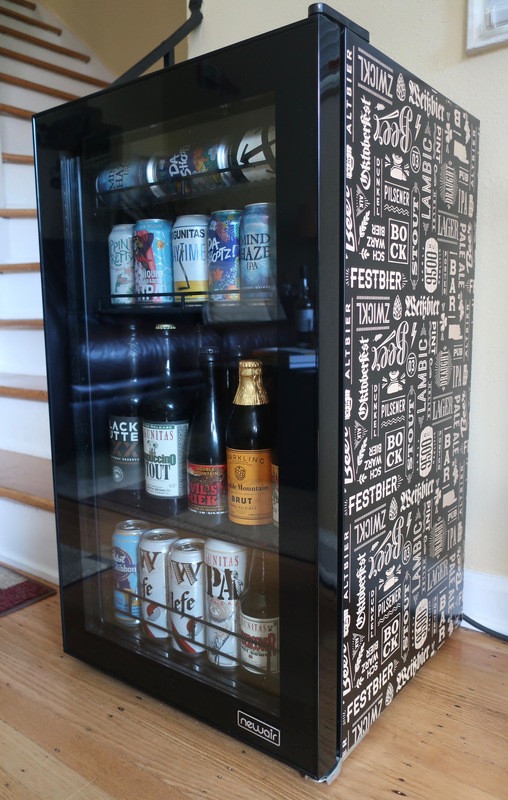 The various beer style names adorn the NewAir Beers of the World Custom Beer Fridge. 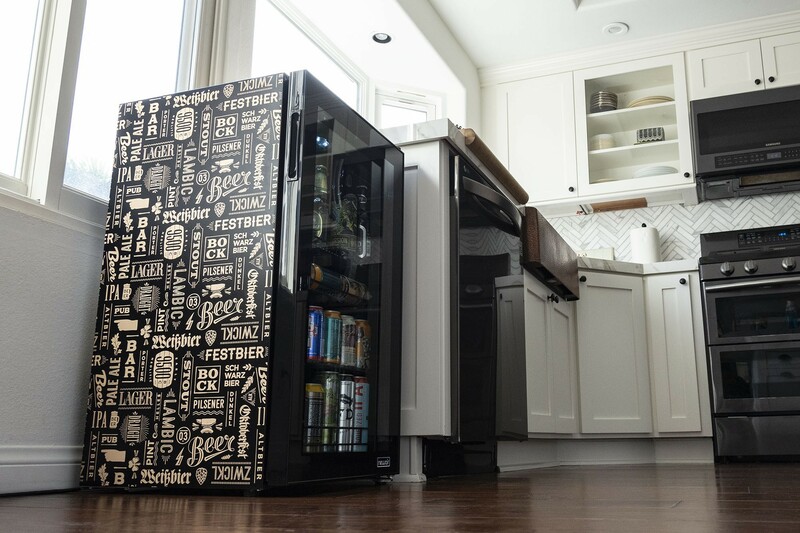 Measuring just 18.5 inches wide and under 34 inches high, this new beer fridge will fit in many spaces. 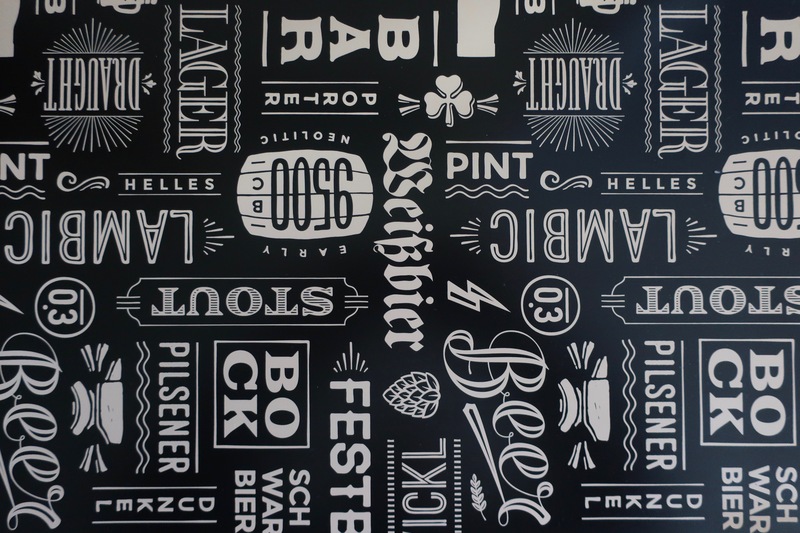 If displayed in the open the Beers of the World Fridge features a sharp black exterior with an all-over print filled with graphics reminiscent of hand-printed beer signs and vintage bar art. NewAir was founded by Luke Peters over 15 years ago. In the company’s infancy it primarily sold portable air conditioners and evaporative coolers. Its product scope has grown considerably since that time and now includes a wide range of compact appliances, from heating and cooling, to wine and beverage coolers. The NewAir Beers of the World Custom Beer Fridge is a great addition to keep your beers chilled. The NewAir Beers of the World Custom Beer can be purchased online directly from NewAir for $329.95 with free shipping by clicking HERE.